Frank Bainimarama – Fiji’s prime minister and the current chair of the four-nation Melanesian Spearhead Group (MSG) – has joined the chorus of criticism of Kevin Rudd in advance of Monday’s leadership vote in Australia, accusing him of having neglected the Pacific as foreign minister. He said Canberra’s lack of attention to the region – and especially its policy of shunning Fiji – had weakened Australian influence in the Pacific and had created a vacuum that bigger powers were moving to fill. Countries such as China and Russia were building relations with the smaller island states and strengthening their presence in Australia’s backyard. “They should be worried but they’re not”, he said. “ I don’t think they are taking it very seriously”. 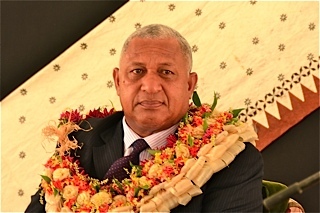 In an interview with Grubsheet in Suva, Commodore Bainimarama revealed that both the United States and New Zealand had broken ranks with Australia and had renewed their official contacts with Fiji, severed after his coup in December 2006. No Australian diplomat or minister has had a formal meeting with the Fijian leader in the intervening five years in protest at the removal at gunpoint of the elected government of Laisenia Qarase, which Bainimarama claimed was racist and corrupt. Yet the United States no longer has such qualms, evidently concerned that Australia’s continuing hard-line stance has driven the Fijian leader into the arms of the Chinese. The American ambassador in Suva, Frankie Reed, has resumed regular contacts and a team of FBI agents has been in the Fijian capital training local police. “We have no problems with our relationship with the United States”, Bainimarama said. 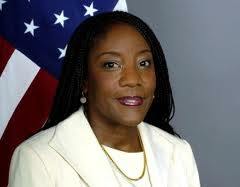 “The American ambassador came to see me and attends all our functions. She’s friendly and our relationship is good”. While the Fijian leader is banned from Australia – along with anyone associated with his regime – he was granted an open visa to visit the US last September and had engagements in Connecticut, Florida and Tennessee. “It seems odd that I am welcome in the world’s greatest democracy and not Australia and NZ but I’ve come to accept it”, he said. In the case of New Zealand, Commodore Bainimarama said the renewed level of engagement was more modest. The travel bans on him and members of the regime remained but unlike Mr Rudd, the NZ foreign minister, Murray McCully, had been in contact with Fiji’s foreign minister, Ratu Inoke Kubuabola. “I think the Kiwis are more understanding than the Australians. I don’t really know why but there’s a large number of Fijians in NZ and I think they’ve put pressure on them to talk to us”. “I see representatives of some of the world’s biggest democracies – the Americans, the Indians, the Indonesians, the Japanese, the South Koreans and the French but not Australia. It doesn’t make sense”, he said. While the Fijian leader declined to speculate on why American policy had changed beyond agreeing that an “about face” had taken place, concern has been expressed in Washington about Beijing’s ambitions in the region and especially its close ties with Fiji. Describing China as a “friend” which had given Fiji “about $200-million in soft loans”, Commodore Bainimarama said Australia only had itself to blame for the increasing Chinese presence in the region. “They are giving us support politically because everyone has withdrawn. They have recognised our sovereignty, which is very important for us”, Bainimarama said. The Fijian leader contrasted Mr Rudd’s lack of interest with the recent visit to Fiji by Russia’s foreign minister, Sergey Lavrov, who made the first ever journey to the region by a senior Russian official. He said that unlike Australia, Russia appeared to recognised the growing importance of the smaller island states and wanted closer ties. “Maybe he (Lavrov) thinks everyone has backed off and this part of the world needs assistance”, he said. 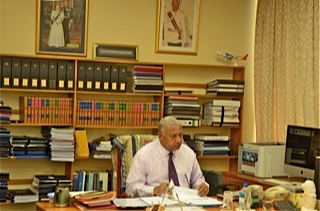 During his visit to Nadi at the beginning of the month, Mr Lavrov held talks with Commodore Bainimarama and other Pacific leaders who are members of a new voting bloc at the United Nations that Fiji has played a major role in forging – the eleven member Pacific Small Island Developing States ( PSIDS). The Fijian leader castigated Mr Rudd’s junior minister for the Pacific, Richard Marles, for having expressed concern that Russia was exploiting small states in the Pacific and was engaged in chequebook diplomacy. 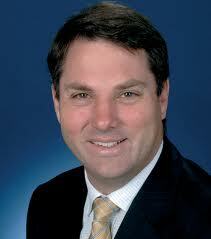 “He (Marles) is a hypocrite. He’s talking about chequebook diplomacy? Hasn’t he been giving money to the Pacific island nations in the last five or ten years?” Commodore Bainimarama denied that Mr Lavrov had offered Fiji and the other PSIDS countries financial assistance to recognise its puppet governments in South Ossetia and Abkhazia – territory also claimed by Georgia. “He gave Fiji a donation to help us with our flood appeal but that was it”. Australia cut off ties with Fiji after Commodore Bainimarama’s 2006 coup and imposed a set of “smart sanctions” – including travel bans – in support of its demand for an immediate return to democracy. The Fijian leader has steadfastly refused to comply, insisting instead on a new constitution to remove racial inequality, followed by elections in 2014 based on one man one vote. Previous elections in Fiji have been weighted in favour of the indigenous majority. As foreign minister, Mr Rudd resolutely ignored pleas to re-engage with Fiji, including from two influential Australian foreign affairs think tanks, the Lowy Institute and the Australian Strategic Policy Institute (ASPI). Last year, the head of the Lowy Institute’s Melanesian program, Jenny Hayward-Jones, also accused Mr Rudd of neglecting the region and called for re-engagement to encourage Fiji to stick to its promise to restore democracy in 2014. Lowy and ASPI joined ranks with the Vanuatu-based Pacific Institute of Public Policy, which has been a long standing advocate of engagement with Fiji. Commodore Bainimarama said Australian policy towards Fiji under Kevin Rudd was governed by “pride, not good policy”.“ He has personalised it, the way he called me a pariah and a dictator. He is a very ambitious politician and it’s been clear that he wanted to be prime minister again”. Describing Mr Rudd as the “main impediment” to better relations with Australia, Commodore Bainimarama said Canberra had continued to insist on an immediate election in Fiji even though it could never be truly democratic without fundamental reforms. “We are beginning work in a couple of weeks on a new constitution. We are not going to have elections tomorrow. We’re not going to have elections next year. We’re going to have elections when we’re ready and that will be before September 2014, as I’ve said all along”. 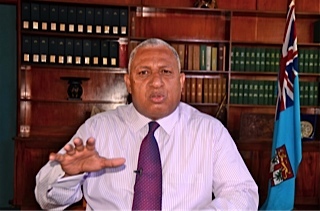 Commodore Bainimarama said his election as chairman of the Melanesian Spearhead Group after Australia succeeded in having Fiji suspended from the Pacific Islands Forum – the other major regional grouping -showed that Canberra was out of touch with sentiment in the region. The MSG encompasses 95 per cent of Pacific islanders, living in its member states of Papua New Guinea, Fiji, Solomon Islands and Vanuatu plus the Kanaks of New Caledonia. “Only Canberra and Wellington see me as an outcast”, Commodore Bainimarama said. “Nobody else does”. The Fijian leader accused Australia and NZ of driving a wedge through the Pacific by playing Polynesian countries off against their Melanesian neighbours. He described the Samoan leader, Tuilaepa Malielegao, as an “Aussie and Kiwi puppet” for his continuing attacks on Fiji. Tuilaepa has accused Commodore Bainimarama of “lying” about his intention to return to democracy in 2014 and said he was “leading everyone down the cassava patch”. The Fijian leader said he was not willing to trade insults with his Samoan counterpart but it was clear that he was doing the bidding of Australia and NZ. “It seems that every time he runs out of money, somebody winds him up and he plays to their tune. He goes “Fiji is no good, there’s a lot of problems in Fiji”. I don’t know why he spends a lot of time rubbishing Fiji but I have no time to be thinking about him”, he said. Commodore Bainimarama said that while he “didn’t want to get involved in Australian domestic politics”, Fiji’s best hope for a change in Australia’s attitude rested with Tony Abbott winning the next election. “I understand that Abbott is more understanding of the situation than Kevin Rudd and his team. And, yes, I would think there may be a change in policy.” Commodore Bainimarama agreed that Tony Abbott’s reputation as a sportsman and champion boxer meant that he was more likely to get on with him. “I would love him to bring about some change in policy, in the way we conduct our business. Yes, I will try to reach out to him if he wins. 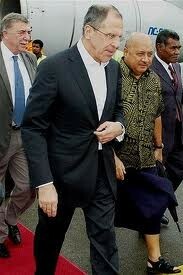 He’s welcome in Suva at any time”. A shorter version of this article has appeared in News Limited papers in Australia, including the mass circulation Sydney Daily Telegraph. The full version has appeared in the Fiji Sun and Pacific Scoop New Zealand. It’s getting repetitive isn’t it? Australia does not understand me but everyone else does. Not true, just Australia is sticking to its guns. Interesting that the only reason given for change of policy by the US is their worry about China. The only reason for the calls for Australia to change its policy is concern about Chinese influence. There are no calls to change policy because of the steps Bainimarama has taken in moving Fiji towards democracy. If you talk to all of the ambassadors from first world countries, not just the Western democracies but also Japan and India, they all have much the same to say when they meet with Frank, They put forward their policies and suggestions. Frank does not listen end of meeting. There is no outcome from any of these meetings just a little diplomatic protocol enacted. To say Australia has forgotten Fiji is madness. It is still the biggest donor to Fiji (They give aid, not soft loans which the government after 2014 will have to repay). Just not to the Fiji Government. Australia gave over $2.5m for flood relief. We have not heard one word of thanks from the dictator. Russia gave $30k and we have heard lots. At least Lavrov had learnt enough in his time in Fiji not to entrust Russia’s money to the PM’s fund but gave it to the Red Cross. You mention the FBI training the police in Fiji. The Australian Police Force are in Fiji 3-4 times a year training the Fiji Police. I commend Australia for sticking to their guns. Bainimarama is still a dictator. The Human Rights abuses continue, The rule of law has ceased, the army is still in control with their guns. The only thing that has changed is Frank supports which ever country gives him money. That happens to be China at the moment and so China has more influence. But next year it might be Taiwan or Russia or …..
Australia on the other hand has shown great loyalty to the people of Fiji. It continues to donate money, it continues to support the tourism industry. When times are tough they are the first with their aid and their help. And they don’t even get a thank you from an ungrateful dictator. content can be lucrative and a good way to do Internet marketing. Spill Under is when the people under you sponsor people making your business grow. You may not be aware of this, but there are a few websites on the Internet today that will allow you to build a free web page.